Painful Joints in Hands and Feet * 10 Treatment Modes: Press Knead Vibrate Thump Waist Shoulder Feet Joint Legs Back. Easy to Operate * Electricity & Batteries * Screen & Time Set * Voice Guide * 2 x Output for Therapy * Double Effect - You can use them simultaneously and choose two therapies at same time for the better therapeutic effect. Conductive gloves and socks was made by special silver fiber material, which can fully contact with hand and feet holographical reflecting region and acupuncture points, achieving the best health management. 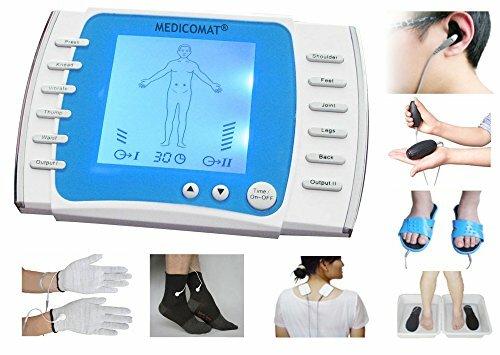 Medicomat ear acupuncture provides an efficient and fully automatic treatment for the whole body, complemented by the effects of body acupuncture massage therapy through the palm and foot electrodes and conductive silver fiber socks and gloves. The only thing the user needs to do is to choose the pulse that suits him the best and adjust their intensity to feel pleasant.